On June 30, 1865, James Pollock, director of the Mint, proposed that a coin made of nickel alloy in the denomination of five cents would be a good substitute for the five-cent fractional currency notes then in circulation. Although half dimes were being produced, they, like other silver denominations, did not circulate. In the same year a number of patterns for the new coin were made. After early July 1862, silver coins were withdrawn from circulation, and the Treasury no longer paid them out. The public, not knowing whether the Confederacy would win the Civil War or if the Union would be the victor, hoarded hard money of all kinds, from Indian cents upward to $20 pieces. The Treasury Department continued to produce gold and silver coins, but did not pay them out in commercial transactions until the 1870s. Although a number of interesting patterns were made featuring the portraits of presidents Washington and Lincoln, James B. Longacre's shield design used earlier on the 1864 two-cent piece was adopted for circulating coinage. With modifications it formed the obverse. The reverse depicted the numeral 5 surrounded by a circle of stars with a ray between each. Soon the motif became known as the Shield type. In the second year of circulation of the Shield design, 1867, it was determined that the bars or rays on the reverse caused too much metal displacement and resulted in striking difficulties. Indeed, surviving specimens of the with-rays design minted in 1866 and 1867 often display weakness. As a result, following a nominal coinage of 1867 nickels with rays, the feature was dropped. The new design, without rays, was continued through 1883. 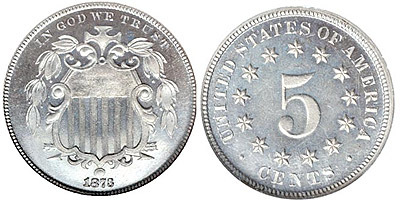 The appearance of the without-rays nickel in 1867 caused public confusion, and many merchants and others refused to handle them, believing the pieces to be counterfeit. An explanation from the Mint apparently was worded in a confusing manner, for soon a percentage of the populace believed that the earlier nickels with rays were the counterfeit ones, whereas the without-rays style coins were genuine. The nickel five-cent piece found ready acceptance with the public. Mintages were generous during the first several years of its introduction. A vivid exception was provided by the 1877, struck in a year when other minor denominations experienced reduced mintages. It is believed that fewer than 1,500 Shield nickels were issued that year, all sold as part of the Proof sets distributed to collectors. The following year, 1878, saw a mintage of just 2,350 pieces, also struck only in Proof condition for collectors. Mintages of the 1879-1881 years were also low, primarily because the Philadelphia Mint was concentrating on silver dollar production at the time. In 1882 11 million were coined. In 1883, the last year of the Shield nickel design, 1,456,919 were struck. The Hardness of the nickel alloy caused many striking problems. As a result, numerous Shield nickels today are seen with evidence of die breaks, ranging from minute to major. Still other coins show weak striking in areas. Indeed, a perfectly struck Shield nickel, sharp in all details and without any evidence of die breaks, would be unusual among coins struck for circulation. The hard nickel alloy resulted in rapid die wear. To extend the life of dies, some were softened and then repunched with the hub, thereby sharpening the impression. The result is that numerous repunchings occur on the letters and other features of many issues. Repunched dates are likewise common. Two sharp overdates, the 1879/8 (Proofs only) and 1883/2 (business strikes only), exist in the series. Another coin with a recut date has been styled as 111869/811 by some authorities, although the undertype is not sharp enough to permit unequivocal identification. Proofs for collectors were made of each issue from 1866 through 1883 inclusive. Only a few 1867 Proof nickels with rays were made, for the design was changed early in the year. While Proof mintage figures for the 1867 with-rays style apparently were not kept, an estimate would be 25 to 50 pieces. 1877 and 1878 shield nickels are Proof-only issues, as noted. No examples were struck for circulation in those years.